Food manufacturers will be able to identify very small contaminants in a quicker and more reliable manner following the launch of a new X-Ray system from METTLER TOLEDO Product Inspection. The X34 X-Ray inspection system provides detection of metal, glass, high-density plastic, mineral stone and calcified bone fragments across a wide range of packaged foods, eliminating costly product recalls and protecting brand reputations. The system also comes with advanced software that enables automated product set-up, dramatically decreasing the chance of human error and greatly reducing the number of false rejects. This makes for more efficient and profitable operations, while delivering excellent return on investment. The X34 is a single lane X-Ray system designed for the inspection of a wide range of small and medium-sized packaged products. One of its key features is a 100W "Optimum Power" generator, which automatically maximizes detection sensitivity. This is complemented by an advanced 0.4 mm detector for the accurate detection of very small contaminants. These technologies ensure that power and contrast levels are optimized for every product, resulting in enhanced detection performance. This means the X34 does not always have to run at its full 100 W output to achieve the best results, delivering power savings to the end user. 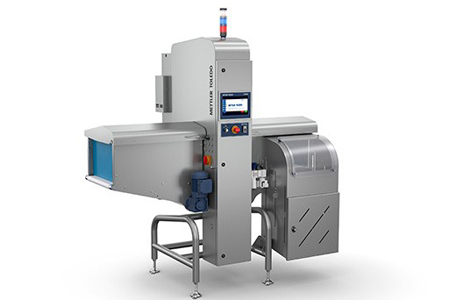 The X34 comes with METTLER TOLEDO’s advanced ContamPlus inspection software, which further enhances detection capabilities, helping food manufacturers achieve a zero False Reject Rate (FRR). This is a crucial means of reducing product waste and ensuring product safety. By lowering FRR, manufacturers can achieve higher production outputs without adding extra lines, boosting productivity and profitability. Subsequently, Total Cost of Ownership is reduced and Overall Equipment Effectiveness scores are increased. In addition, the X34 can be equipped with the ProdX advanced data management tool, which maximizes production efficiency and quality control. The ProdX software can store images of foreign body contamination, which can be viewed remotely, in full support of connectivity, traceability and compliance. The system also features a highly-responsive capacitive touchscreen, allowing users to increase the viewing angle of stored images while maintaining image consistency.